February 11, 2008, 10:54 PM · When the composer Joseph Schwantner wrote a fantasy for amplified violin and orchestra for violinist Anne Akiko Meyers, he called the piece Angelfire. "He says he entitled that after knowing me," Meyers said, laughing. "Supposedly I was an angel off stage, but like a tigress on stage." Recently I interviewed Anne in Los Angeles, and I also saw her play an intimate recital for L'Ermitage Foundation, with pianist Kevin Fitz-Gerald. She was in the area to also play the Mendelssohn Violin Concerto for series of concerts with the New West Symphony (which were met with great enthusiasm). Schwantner does have a point. Onstage, she wore an all-black, simple sleeveless gown, her dark hair slicked back, her wide smile punctuated with dimples. She began with selections from "Pulcinella" by Stravinsky, and after three notes from her 1730 "Royal Spanish" Strad, the luthier sitting next to me whispered to no one in particular, "WOW." Meyers has an ease with her powerful instrument; She wears her technique like she wears her nose – it's simply a part of her. There's nothing tortured in Meyers' violin playing, nothing to distance the listener from it. She hasn't pasted something artificial to its surface, like a perma-vibrato or pressed sound; her sound is fluid and changeable. During a passage of fast spiccato (a jumping-bow stroke), I jotted down, "it's so solid – one gets the feeling she could do it hanging from her knees, upside-down in a tree." "I just had to take this out of the dusty vault and shine some light on it," she explained to the audience before playing Respighi's "Poema Autunnale," a piece I certainly was hearing for the first time. After a slow introduction, the piece revved up, giving way to some octaves and other passages that made me understand why the piece sleeps in silence – it's gnarly hard! Pretty soon she was playing attack chords – the musical equivalent of punching a punching bag. It looked so satisfying. Go girl! Get it out! Give 'em hell! But then it dissolved into harmonic glissandos, circular-sounding, calming down, thinning out. At the end of her recital, she played "Somewhere Over the Rainbow," which she introduced as "one of the most beautiful tunes written in the American language." "This kind of music just makes me so happy," she told me earlier in the day, speaking also of Charlie Chaplin’s "Smile." "It's so moving on such a deep level. It’s the lyrics, but it’s also the arrangements -- such a simple melody can hold such deep feeling. I think that’s what I absolutely crave and look for in any music." 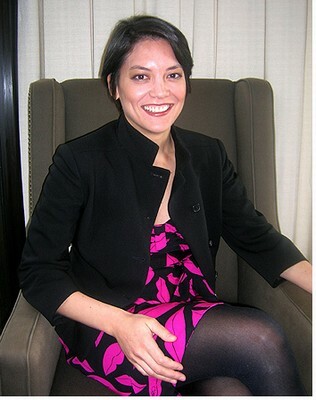 Meyers, of Japanese and Caucasian descent, is wrought in the American language and culture as well. Born in San Diego, her father is a university president from Chicago and her mother is a painter from Tokyo. Anne started playing the violin at age four, and her journey as a violinist has taken her to concert stages from Carnegie Hall to Sydney, Australia. She has appeared on television shows and magazine covers all over the world. At age 11, she appeared twice on Johnny Carson's "Tonight Show," and at age 23 she was awarded an Avery Fisher Career Grant. "I remember the day that I got the violin," she said. "I was standing on the couch in the living room and I was trying to play it upside down. My father walked over and said, 'No, actually, to make a sound with it, you flip it up.'" It didn't take her too long to figure it out. Her first teacher was Suzuki teacher Shirley Helmick. "She was wonderful in that she found it necessary and important for my development, to read music," Meyers said, "She had me read the notes from the start, so I was very thankful for that. I was told that everybody was supposed to learn a piece for Suzuki class, and I was the only one who came the next day and really learned it and memorized it. It just was instant, natural talent with the violin -- like some kind of strange happening." At the time, her family lived in Ridgecrest, in California's Mojave Desert. When she was seven, they started driving to Pasadena for lessons with Alice Schoenfeld. "My mom was making this trek, three hours each way, from the middle of the desert to take me to lessons until my father was able to secure another job," Anne said. " I just can’t even imagine doing it without the support and dedication of my family." kinds of things, that kind of sophistication, at such a young age, was incredible." As a teenager, Meyers went to Indiana University, where she studied with Josef Gingold for what she called "a very short six months." "I was way too young, 13 or 14 years old, and it seemed like everybody was a doctorate student," Meyers said. "They didn’t have a pre-college division back then, and so I was going to normal high school in Bloomington." The family finally made it to New York, and they settled in Bedford Hills, where Meyers went to Bedford Hills High School. On the weekends she went to Juilliard pre-college, and "I fit right in to the Juilliard scene; everybody was basically my age," she said. Among her peers were Gil Shaham, Midori and Matt Haimovitz. "Everybody was incredibly talented -- you just took it to be part of your air that you inhaled," she said. "Looking back, I realize how much talent was there." "I remember those guys were always playing practical jokes. I had to lead the quartet with Gil (Shaham) and Misha (Keylin) and I think it was Chee-Yun Kim, and we were playing at Carnegie Hall," Meyers said. "I opened up the music, and there’s a photo of Sylvester Stallone, naked, in my part," she laughed. "It’s like, thanks, guys." Now in her mid-30s, Meyers is a veteran of the violin soloist lifestyle. "It is definitely a very challenging life and lifestyle," Meyers said. "When I was about 23, it was at the height of a lot of things. I just was in the middle of a recording session with Andrew Litton and the Philharmonia Orchestra. We were recording the Mendelssohn concerto, and I had this exclusive contract with RCA. I was playing maybe about 80 to 90 days a year, and traveling alone as a single woman, which has its challenges. I started to feel a numbness in my pinkie, and then it was announced that I’d won the Avery Fisher prize. Career-wise, it was just wonderful, but I felt like my life was just out of control. There was just a deep loneliness, and feeling of being so isolated. Eight o'clock comes, watch the monkey play. There’s that feeling, where you’re almost like a one-trick pony. You wonder, what is there, really, to this life? To be playing the same repertoire over and over and over again got to be so fatiguing." "That’s when I learned about my body: stretching, massage therapy, becoming more holistic. Not having to say yes to everybody and everything, and being more in control of your projects," she said. "What really fascinates me is to have a project where I’m working with a music director or working with a composer to write something new and then to premier it and record it. That, to me, is totally exciting." And that is just what she has done: championed the works of modern and living composers. The list of new music she has premiered is long, including works by David Baker, John Corigliano, Nathan Currier, Roddy Ellias, Karl Amadeus Hartmann, Jennifer Higdon, Arvo Part, Manuel Maria Ponce, Somei Satoh, Teddy Shapiro, Joseph Schwantner, and Ezequiel Viñao. Besides being the inspiration for Schwantner's "Angelfire," Meyers also has inspired Japanese composer Satoh, who wrote his Violin Concerto for Meyers, "I’m a huge fan of his piece for violin and piano entitled Birds in Warped Time II." She gave the piece its premiere in Japan. She also has worked with Argentinian composer Viñao. "He wrote this piece, very difficult piece called Saga (check out the Wanderer movement) that I played with the Absolute Ensemble with Kristjan Jarvi -- it was a straight shot Saga." She also feels strongly about Concerto Funebre by Karl Amadeus Hartmann. "I just absolutely went bonkers playing that piece," Meyers said. "It’s so beautiful and dark. It’s almost like the sun when it just comes out from the clouds, finally, and you just feel bathed in light. The ending is so stunning. Rostropovich had just died when I played that, and also a very good friend of mine who used to run my website -- a young man who died tragically. I just kind of absorbed myself in that music, and it was just kind of very cathartic in a lot of ways." Meyers has yet to make a recording of the Hartmann. Meyers is now playing on a violin that she owns herself: the 1730 "Royal Spanish" Stradivarius, once owned by the king of Spain. "I've had it couple of years now," Meyers said. "I was very lucky to find this violin, and this owner, who’s passed away now. She was very particular about who she would sell her collection to, even though this violin belonged to her deceased husband. It went through a dealer in New York. She heard me play at Carnegie Hall, knew my music, and we just had to agree on the price." "I’ve performed on Guarneris and other Strads -- almost every album I’ve recorded is with a different violin," Meyers aid. "I never loved returning the instrument. It’s like having your left arm amputated. You’ve just inserted your personality into this violin for two, three years, and they say, 'We want it back now.'" "But now that I own this violin, no one can do this," Meyers said. "It’s very powerful, knowing that you own your own equipment. It’s not like Sophie’s Choice anymore." Meyers also uses a Peccatte bow. "You do flip out when you find a perfect bow," she said. "I would die without that Peccatte. It’s my life blood. But I would love to find another bow, to alternate. It’s been this crazy process, just try, try, try. You start to think, okay, I am just too picky? But nothing compares to my Peccatte, and to be able to buy it -- there’s my Mercedes 500 SL, right there." It's funny, to think that a violin costs that much, but also a serious problem for young violinists. "It’s really a tough choice today for a lot of young artists," Meyers said. "Do I put a roof over my head, or do I buy a good violin? I asked Meyers how much she practices, and she said about two hours a day. Though life can't be all violin, all the time, the discipline of practice can be calming. "It does give you a centering feeling," Meyers said. "A lot of times, when there’s just absolute chaos going in my life, then I finally sit down for half an hour -- I can exhale." February 12, 2008 at 06:17 AM · What a beautiful and enlightening interview. Thank you, Laurie, for sharing this with us - and my deepest thanks to Ms. Meyers for her candor. February 12, 2008 at 07:46 PM · A fine interview - and an inspiring reminder that quality of practice is more important than quantity. February 13, 2008 at 02:15 AM · What an amazing performance!! !